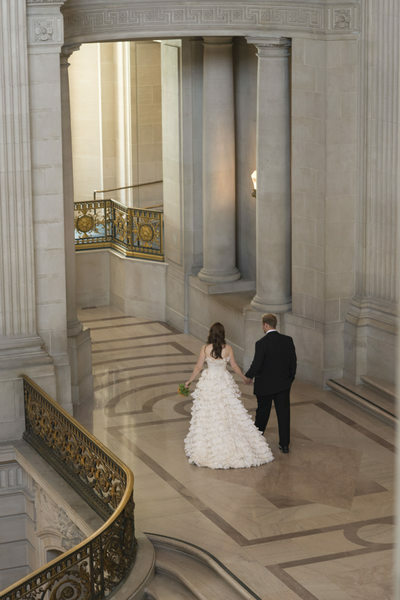 Sara and Toby decided to have their wedding at San Francisco City Hall because they wanted beautiful photos of the building architecture coupled with the convenience and pricing. 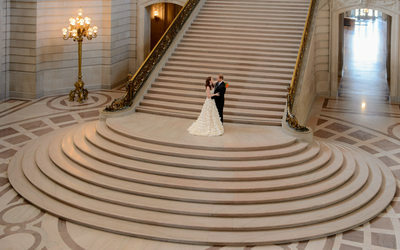 SF City Hall allows a couple the chance to have their wedding at one of the West Coast's truly amazing venues at discount pricing. 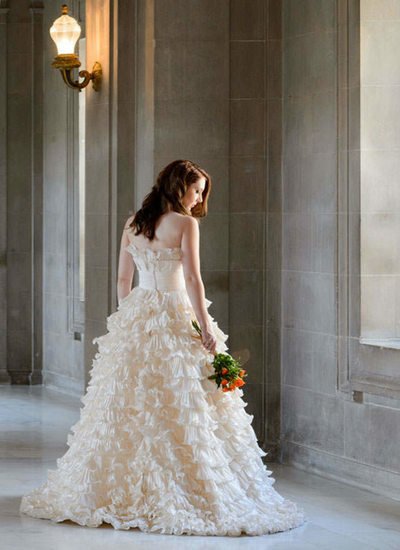 Sara's gorgeous wedding dress worked so perfectly with the background textures and colors at City Hall. 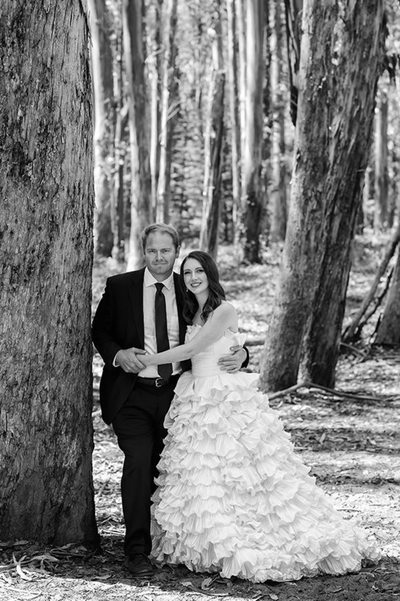 We purposely used more natural light than normal in order to capture the detail of the dress yet keep the lighting soft and warm. As is evident from the photos above, the window shots really worked and we see nice contrast between the colors of the dress and the background. It can be difficult to photograph the Bride and Groom on the Grand Staircase without other people wandering around, but sometimes you can get lucky. It also depends upon what time it is and the day of the week. We have found that Tuesdays and Wednesdays give us the best chance to get this type of shot. Mondays are good too! It's easy to see why so many of our clients want photos on the Grand Staircase. 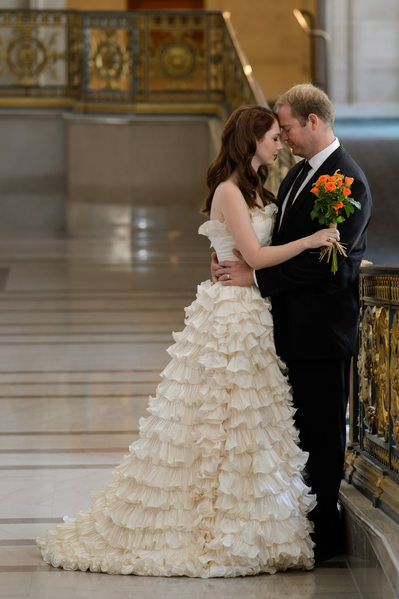 They booked us for a total of 2.5 hours which included the signing of the marriage license by the witness, ceremony shots, family shots (if needed), and a photo tour around San Francisco City Hall. Once this was all completed it was time to leave city hall to go out into San Francisco. 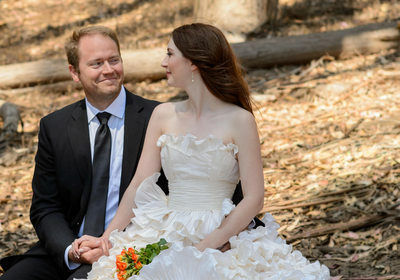 Our first stop was the Presidio for some romantic wedding photography at a place called Woodline. 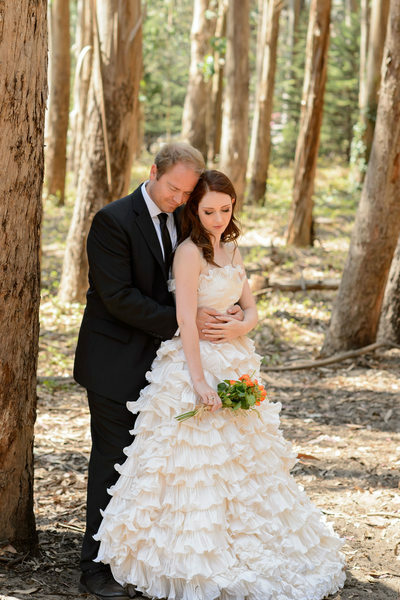 They wanted an intimate non-touristy setting and Woodline was just the place to take them! Our Golden Gate Package offers 1 additional location (like Woodline) and we provide the transportation. We spent about 20 minutes there and got some beautiful photos.